From the author of the award-winning guide Travels with Baby comes this pocket-size survival manual for parents traveling with small children. Packed with hundreds of on-the-go tips, parents get quick access to the information and advice they need as they travel, including: babyproofing hotel rooms or vacation rentals on arrival, keeping babies happy in the back seat, managing toddlers on airplanes, translating various baby items and conversions while traveling abroad, and finding medical help or remedies far from home. Age-appropriate games and activities also help keep babies, toddlers, and preschoolers entertained in transit. Plus special sections help parents organize their travel details for each trip and also make it easy to fill in the blanks to log favorite family moments along the way. Winner of the Rising Star Award in the National Parenting Publication Awards and Finalist in the IndieFab Book of the Year Awards. More at www.TravelswithBaby.com. The book is available in Paperback and eBook editions. From the author of the award-winning guide Travels with Baby comes this pocket-size survival manual for parents traveling with small children. 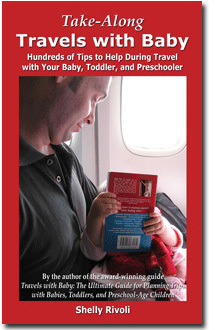 Packed with hundreds of on-the-go tips, parents get quick access to the information and advice they need as they travel, including: babyproofing hotel rooms or vacation rentals on arrival, keeping babies happy in the back seat, managing toddlers on airplanes, translating various baby items and conversions while traveling abroad, and finding medical help or remedies far from home. Age-appropriate games and activities also help keep babies, toddlers, and preschoolers entertained in transit. Plus special sections help parents organize their travel details for each trip and also make it easy to fill in the blanks to log favorite family moments along the way. Winner of the Rising Star Award in the National Parenting Publication Awards and Finalist in the IndieFab Book of the Year Awards. The book is available in Paperback and eBook editions. Shelly Rivoli is a Lowell Thomas Award-winning author and the founding editor of TravelswithBaby.com and FamilyTravel411.com, both of which have received multiple NATJA Awards including Bronze and Silver in Independent Travel Blogs and Silver in Online Travel Magazines respectively. A respected family travel expert, her travel advice has been quoted in all major national parenting magazines, the LA Times, and Boston Globe, among others, and she was a recurring guest on ABC 7’s View from the Bay. She hangs her hat in the San Francisco Bay Area.